You’ve done your research. You know of the undeniable environmental and financial benefits of solar power, and you’re ready to make it a priority in your life—but you’re still unsure about the up-front cost of installing and maintaining a solar system. Here’s some great news to put your mind at ease. If you’re a homeowner, there are some ways to reduce how much money you need to invest all at once. In some cases, with a solar lease you can even get solar panels without paying anything up front, and your monthly payments will simply replace the cost of your monthly electric utility bill with affordable solar leasing. There are two basic ways homeowners can get free solar panels—by signing a solar lease or Power Purchase Agreements (PPAs). The primary differences between them are 1) whether you pay to lease the solar system equipment or for the power produced, and 2) whether or not you have the option to purchase your solar system. Of course, nothing in life is completely free—the cost of the solar panels is figured into your monthly bill and spread out over time, but this makes the overall payment much more convenient. Both of these approaches offer some very appealing ways to save. 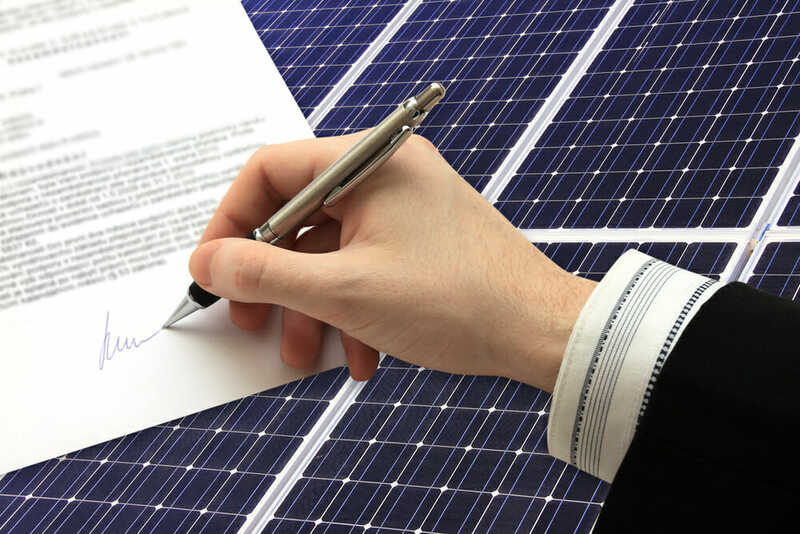 Let’s take a look at the two choices to see why you may be interested in a solar lease or PPA. Under a solar lease agreement, things are pretty hands-off for the homeowner. You lend a solar services provider your roof, and they’ll lend you the equipment to generate clean, renewable energy. Here’s how it works. In addition, your solar provider will handle the installation and maintenance of your solar system, and perhaps additional warranties, insurance, and repairs. Again, take a close look at the terms—in some cases, you remain responsible for replacement of failing equipment. Down payment. Is there a payment due when you sign the contract? At installation? At inspection? Most companies require zero down when leasing. First monthly payment. What is the initial monthly payment? Some lease agreements offer the option to pre-pay some of your electricity in order to lower your monthly payments, much like you would when financing a car. Rate increase cap. Electricity prices tend to rise about two to five percent each year. So the monthly amount you pay your solar company to provide your power may also increase slightly year to year. However, your lease agreement will include a cap on this increase so that your monthly payments never increase by more than a set percentage, usually about one to five percent. How long is the lease term? Traditional leases are usually 20-30 years, about the life-span of your solar panels. What happens at the end of the contract? At the end of your initial lease term, your options may include renewing the contract for one to ten years, upgrading to a newer solar system and signing a new contract, or removing the system. Can I purchase my solar panels? No, a typical solar lease does not include the option to buy at the end of the contract term. What happens if I move? If you decide to move, your options may include transferring the lease and payments to the buyer of your home, moving the solar system to your new home, or removing it. By leasing, you replace your monthly utility bill with a monthly equipment lease payment and pay no cash up front. You enjoy low (or no) installation and maintenance costs. But when you lease, you usually don’t have an option to buy. Also, by leasing your solar panels, you forfeit the ability to gain price advantage through net metering—selling any power you use back to your local utility. A word of caution: Before you start searching for a solar installer, make sure leases are available where you live, because they may not be available in less-sunny states. Another way to finance your solar system is through a PPA. Under this option, you purchase the electricity that your system generates—instead of the system itself—at a reduced rate over a fixed period of time. Your payments are determined per kilowatt hour (kWh) of energy used. You’ll also have the option to purchase the solar system at predetermined times throughout the lease term. A fixed escalator plan, in which your electricity prices rise at a predetermined rate between two to five percent (which is often lower than the increased prices you would otherwise pay the utility). A fixed price plan, where the price you pay remains constant throughout the loan term. As utility prices rise over time, your prices won’t budge, which makes for easy household budgeting. Unlike a regular solar lease, with a PPA you have the option to buy your energy system from the developer. The downside of the PPA is that it’s bit more complicated than a lease. And since only about half of the states allow PPAs, you’ll want to first make sure your state is one of them. You can check this map. How much will my energy cost? The cost of electricity will be a fixed, predictable, low rate. It will not increase beyond a predetermined rate, usually two to five percent. How long is the lease term? About 10-25 years. The solar developer is responsible for operation and maintenance of the system during that time. What are my options to buy? At certain points within your lease term—for example, at five years or at the end of the lease—the homeowner can decide to buy the solar system. As the owner of a residential solar system, you may then be eligible for additional rebates and tax incentives. So with a PPA, you make low, fixed-rate monthly payments based on the kWh of energy used, with the added option to buy your system from the developer. As we have seen, with solar leases and PPAs, homeowners can dodge many of the logistical barriers associated with solar installations, like high up-front costs, financing and design, permitting, maintenance, and monitoring. All you provide is your property and a commitment to make fixed monthly payments—and the service provider handles the rest. Also called “third-party ownership,” these two options—not surprisingly—are very popular. In fact, 60 percent of U.S. homeowners with solar have used third party ownership. Solar leases and PPAs make it possible for homeowners to go solar with little or no money down. Plus, your monthly payment ideally is no more than what you’re currently paying your utility for electricity. So the potential for future savings is significant—especially since it starts just as soon as you flip the switch.